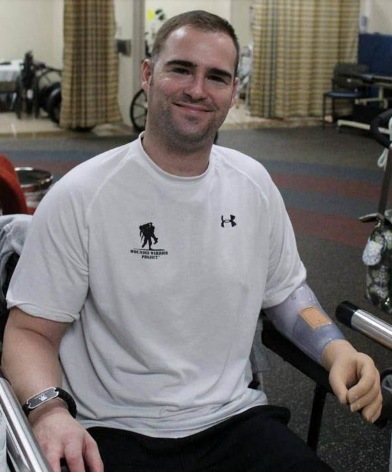 After losing one arm and both of his legs to an improvised explosive device in Afghanistan, Master Sgt. Joseph Deslauriers is moving forward — this time into a new home. The Building Homes for Heroes Foundation, a non-profit founded in 2006, broke ground Nov. 18 on the Deslauriers’ family home, complete with a work out area, a therapy pool and enough space for him to move around freely, according to an Air Force release. Air Force Times reported on the former explosive ordnance technician in August, who worked with a team at Johns Hopkins University’s Applied Physics Laboratory to test an anthropomorphic arm integrated into brain and residual nerve function. “With this [arm], I can open my hand, I can rotate my wrists, I can grab something, and it’s amazing to have something that you can manipulate with your residual limb and eventually with your brain,” Deslauriers said during a House Science committee hearing on July 31. Deslauriers is now back to wearing a nonmechanical prosthetic. Deslauriers was on patrol Sept. 23, 2011 as an explosive ordnance disposal craftsman when he reached a disabled vehicle with an injured Marine and brought him back to safety. After ordering other personnel to stay in their vehicles while he cleared the area, Deslauriers stepped on a buried IED trigger, critically wounding him. However, his actions and gathered intelligence helped extract two injured Marines, two disabled vehicles and let his team finish their mission. For his actions, Deslauriers was awarded the Silver Star. Deslauriers is now an Air Force Special Operations Command explosive ordnance device program manager at Hurlburt Field, Fla.